The Honda Beat scooter is an automatic type motorcycle. This means that shifting gears is no longer done by hands. I recommend this to people who are on the go and want to stay away from traffic stress. This motorcycle comes with different colors (mine is black) with nicely designed stickers and a nice looking fender on the front wheel. It has a wide body platform which can let you sit with ease and comfort even if you have a passenger. The scooter comes with a combination brake system. The front wheel has a disc brake system and the rear wheel has the drum brake system. This is ideal for quick braking and stopping. Another feature that helps me most is the side stand switch, which lets me turn off the motorcycle using the side stand instead of manually turning it off with the key. This is good for people who are always on the run. This also means that when the side stand is used, the motorcycle never turns on. Another safety feature this scooter has is the parking lock. When I want to safeguard my motorcycle while shopping in the mall, I use the right hand brake lock. In doing so, the disc brake locks the rear wheel causing it to be immobile. The Honda Beat scooter runs with a 110cc engine capacity. Now this might mean a slower speed to some but it is definitely good for city drive. It also entails that fuel consumption is lesser than higher CCed motorcycles. Hence, making the Beat economical. This motorcycle has an alloy wheel type. This is more durable and reliable type of wheel metal. It also comes with a mono-shock suspension in the rear wheel. Both the front and back wheels are of IRC brand, a reliable one in terms of wheels. The fuel capacity is 3.8 liters. For best performance, it is recommended to use unleaded fuel. For mine, I fill it up with unleaded Shell fuel. I have not had any major problems with my Beat in terms of performance. I always follow the maintenance schedule which is for every 2000 kilometers, I change the oil and for every 6000, I would have an engine tune-up. This made my motorcycle experience very convenient and not troublesome. Because of my Beat, I have gone to the north (Bogo City) and south (Alcoy Municipality) parts of Cebu. I never got the chance to use the kick start properly. For some reason, the pedal is stuck and cannot be turned. I consulted it with a Honda authorized shop and said that it's a common problem. But personally, this is never really a problem since I am using the automatic start. This may sound very obvious but I would highly recommend going with Honda Beat when choosing a motorcycle to buy. It is economical, safe and very convenient to use. As of this writing, my odometer reading is 16000+. I just renewed my motorcycle registration and had engine tune up and change oil at the same time. Hi sir.... pano po ba ang tamang time para sa change oil para sa beat? Every 1000 po ba or every 500 kms kelangan na mag change oil? Saka ano po ba yung tuned ip na yan kelan po ba yan dapat isagawa? Every 2000 yung sa akin. san yong computer box sa honda beat? Thanks! I've been looking for some inputs whether to get a Beat or a Mio. Most of the posts I stumbled upon to always have a positive one for the Beat. Honda Wave S 125 (s. 3) dati ang gamit ko pero nagkaproblema ako sa electrical wiring.. i got fed up on repairing so i decided to sell it for 20k (bought it Nov. 2004, 66K mileage ata)..
i dont think my Beat have the combi brake feature gya nung mga naunang Beat na na- release.. i cant find that feature dun sa site ng Honda PH or sa manual..
RFS nung Wave 125 ko, bigla ako nagkaroon ng fear sa speed.. dati kasi pag nakainom, sagad ang throttle ko at umaabot ng 120+ kph.. imagine mo kung maaksidente ka at 120 KPH..? dedo na.. kya i decided na mag upgrade ng motor pero dapat mas mababa top speed niya.. so i choose Honda Beat..
nung una.. kulang na 90KPH top speed niya.. tapos fuel efficiency around 40 kms/L.. habang tumatagal, (odometer reading 600 kms) naging mas mabilis na sya.. pati acceleration.. nung huli kong computation ng fuel efficiency, 43kms/L.. feeling ko improving..as of today, 800+ na odometer reading ko.. at umaabot na siya sa 100 KPH.. (nakakamatay pa rin, LOL) all stock.. wala pa ako pinapalitan at wala din akong planong magpalit ng parts.. i had my 1st change oil after 1 month at 600+ kms sa odo reading..
i recommend getting this bike more than YAMAHA mio.. pero kung more on modifications ka, set up ganun, mag MIO ka na lang kc mas madaming parts na mabibili.. Thanks for sharing your insights on the Honda Beat. I just gave up my Yamaha Mio which I used for 2 years for a red Honda Beat. I rode it from the dealer to my home which covered only 6.3klms and for that short distance, I was convinced indeed that it was a very good choice. The stability, handling and comfort in the ride are very significant over the Mio. Actually, this thread changed my decision into getting a Brat over a Nex. I am in my golden years and enjoying riding a acooter now than driving 4 wheels. Wow thanks for your comment Sir! Good choice. I am glad this post helped you in your decision. Drive safely! Just bought a new Honda Beat thanks sir Rene for putting your inputs it was a big help for me in convincing buy Honda Beat MC my odometer reading is only 60 kms. May i ask sir Rene if its ok to fill it up with Premium Gasoline from Petron? Hi Sir, you're welcome! I do not recommend filling up your MC with premium in its early months. That's a recommendation I got from a mechanic friend. For technical explanation, I actually do not know but from a beginner's standpoint that time, I think it has something to do with your MC getting all worked up. I filled up mine with Shell unleaded for the first 6 months then Shell premium and unleaded alternatively until now (almost 2 years). For some reason, my MC performs better with Shell over Petron. Hi Sir, I have no definite answer for this but they say run between 40 - 60 km/hr. My MC story was actually contrary to this idea. In the first 3 months, I ran it to up to 90 oftentimes just to make sure that if ever something would break, I can immediately bring it back to the dealer for checking. My pleasure Sir! Drive safely! Let us go and do some group riding if you are in Cebu. good am sir Rene, may i ask, got my beat last dec. 2012. i'm just curious, does removing the air filter affect the engine performance since ive seen some beat that don't have air filters at all, like modified xa. Hi, yes it does. Removing the air filter will let unfiltered or uncleaned air flow into the engine. This "uncleaned" air may contain particles that are harmful to the combustion process. I am planning to but Honda Beat and I would like to ask if you already tried running it to hilly roads? Yes, I have tried running it on hilly roads. In fact, I am living in a mountainous area here in Cebu. My beat goes through uphills and downhills on a daily basis. Thanks sir arnel! You will never regret buying one. Thanks for your review sir. I was just off the phone with a Yamaha dealer pushing for a mio @ PHP65900, after reading this, I then called Motortrade to reserve a red Beat for me @ only PHP61. Now I am trully convinced to get the Beat. Will share my experience after I get the MC, hopefully by next week. Hi sir Rene, I'm planning to get a motorcycle this December. And there are a lot of good comments about Honda Beat and I'm pretty excited about it. Thanks for reviewing your good experience and other guys whose enjoying their Beat right now. If I get Honda Beat, is there any changes when it comes the speed if get it into lowered type scooter? tnx sir. Drive safely guys and God bless. by the way I'm here in Pampanga. Thanks for your inputs Sir! :) Well said! hi there..how many months does a genuine/orig battery last on honda beat? 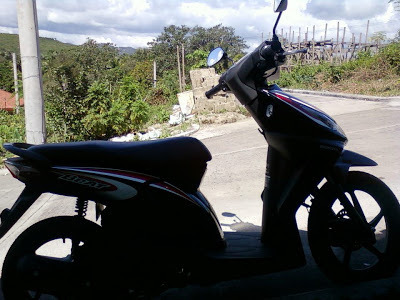 got my honda beat last 2011..den after a year and 11 months po (lowbat na xa),pinalitan ko yung battery kc ayoko gumamit ng crank..(hirap mg.center stand eh..)..nakabili kasi ako nung murang batery at P700+..tumagal lng ng 5 buwan..nakabili din ako ulit, nag.last lng ng 3 months..is it worth it kung bumili ako ng original bat (from honda) which costs P1,800?..will it last gaya nung unang bat (for almost 2years)? thanks po..
Hi, in my case, yung orig bat ko mga 8 months lang nag last. pinalitan ko ng japan 700 lang until now ginagamit ko pa rin. 1.5 years ko na gamit to. So i think ok lang yung non-honda bat. ah...wla po kasi akong alam tungkol sa battery (babae kc,wlang alam sa motor2)..sabi nga nila madali dw mgdrain ang bat ng scooter q,short distance lng po kc ang tinatakbo ng beat ko everyday..15yrs?..pano yun?.pinapacharge nyo ang bat? (sori wala talagang alam)..ng.order n po ako ng honda bat (P1,887)..hop d mglolobat agad..
heheh. sorry if hindi klaro pero 1 and a half years yan.. :) good thing nagorder ka ng orig bat. lupit talaga ng beat. 3x a week umuuwi ako ng obando bulacan from taytay rizal, never ako nadissapoint sa performance nya,. running at an average speed of 70-90kms/hr, my best mc so far since ive got mcycles bfore..
Hi, I'm planning to get a motorcycle, and thanks for this reviews.. I like MIO coz it's trendy and astig.. but no biased.. I am getting the BEAT coz it's Honda.. this might be my second motorcycle.. cross-fingers, sana maapproved yung application ko sa motortrade :).. matagal na rin akong di nakapag MC.. my first MC was Honda dream that was year 2000, though my lolo is using it, until now uma-arangkada pa, never na repair yung engine, tibay!.. I'll get my Honada Beat probably next week.. Thanks again for these reviews. God bless everyone. Drive safely! Drive safely Kirstin! :) Thanks! Hello sir Rene, I got a 2011 honda beat still with its original battery. Everything still works perfect, tibay talaga bastat Honda. Very nice review btw. Glad this helped you Jay! Sir tama ba ung nasagap ko na balita na my ilalabas ang Honda na BeAt Fi? Sir Rene, which is better the Mio or this Beat? need more clarifications before trying to have one of them. @Sir Rene, yup I heard but don't know when ilalabas. @Sir Ron, personally, I choose beat - economical and tibay ng parts. bakit po wala ng unit ng Honda BeAt ngaun? sabi ng mga dealer na phase out na raw. Whats the good & bad new behind this? hi sir rene, im planning to buy honda beat po. pero sabi kasi nila makunsumo daw ito sa gas tapos mabilis magoverflow yung carborador. ganyan po yung mga common na complaints ng mga gumagamit ng beat dito sa amin po. is it true po? Hi Sir Rene, saang lugar yan? Dito sa Cebu, Sa Du Ek Sam and other dealers meron pa.
Hi Sir Anonymous, if you compare fuel consumption sa beat vs yung mga hindi automatic, you can say makunsumo sia but beat vs other automatic, I think this is one of the most fuel saving scooters. Did not hear anything about overflowing of carburetor. Maybe the others can help. any idea po kung kelan irelease ang honda beAt fi d2 sa philippines? @rene no idea for now sir. will comment here pag may alam na ako. I am planning to get my very first MC and thanks so much for this reviews.... I just got the answers to all my questions :) God bless everyone! Unleaded lang muna for the first 3 months tapos pwede na premium after pero I suggest e-alternate mo lang. Wala na po kayang stock ng honda beat ngayon? Nagtanong po kase ako sa du ek sam mandaue city, cebu pero wala na daw stock. Pati sa honda motors wala na rin daw. Wala na cguro bro. Wala napud ko kabantay sa lacion Des. Hi po sa lahat, share lang din po ang sakin. 1 week plang honda beat ko nagustuhan ko lahat at wala akong negative feedback mas ayos acceleration nya kesa sa ibang matic. meron po akong CBR 150 ngayon di na nagagamit dahil sa honda beat ko na enjoy kona cia :) matipid kc sa gasolina at maraming paglagyan pag namimili sa palengke at pang service sa school, in short pang family cia at comfortable ride. binasa ko lahat ng comments dito at ganon lahat ng positive feedback ganon din sakin. Pangpamilya talaga at ekonomiya pa.
hi im planning to buy beat or mio soul..di ako makapag decide..huhuhuh but yong sister ko beat gamit nia 5 years na pero arangkada parin at di pa nasisira..
Hi. Is it possible to find a good used Beat in Cebu? I'm moving there soon. Also, do you need insurance? Thanks. Yes it is. You can check out istorya.net, ayosdito.ph or olx.ph for used motorcycles. Insurance is needed but it will be processed together with the renewal of the motorcycle registration. Sir Rene how about kapag nag change oil kayo? anong gamit nyo? I need suggestions please... Thanks in advance..
Hi sir Kay. honda 4at oil ang ginagamit ko. Wala na akong ibang ginagamit. planning to buy beat sir. mas okay siguro po ito para sa akin na bago pa lng natuto mg maneho, salamat sa mga suggestions and info sir. Nag-research ako tungkol sa long-distance driving kung kakayanin ba ng BeAT, at nabasa ko sa MCP meron na palang nakasubok from Manila to Bicol, sabi doon kahit endurance test pa kakayanin ng BeAT, tinanong pa nga yung mga reader kung kakayanin ba nila yung ganon ka layo kasi sabi nila kayangkaya daw ng BeAT. dito sa amin meron sumubok gamit ibang scooter from Cagayan de Oro to Davao via Bukidnon di umabot nalulusaw daw yung BELT, dahil sa init ng Transmission, nalaman ko iba pala yung V-MATIC at V-BELT yung V-MATIC sa Honda at yung V-BELT sa ibang scooter, matagal na palang alam ng Honda yung heat issue ng mga automatic kaya yung design na napili nila ay V-MATIC, sinubokan ko nga more than 100km ang masabi ko lang Halimaw talaga itong BeAT. Thanks sa review mo sir. Ngayon ko palang nalaman about V-Matic. Yes it can bro pero if racing hindi pwede. hehe. Yung mga bikes nila tataas ng displacement (CC). unleaded ka lang sir. mabilis kase sunugin and premium. especially kapag tumakbo na ng medyo matagal. I just got my Honda Beat 2014. So far so good. First mc. Trying to minimize my fuel expense. so far 400 for a week expense ko, kasama na mga lakad lakad. Good thing you chose Honda Beat sir. Safe trip! If I have my beAt these comibg days, uunahin ko imodz ang front fender.. Medyo itatas ko konti sa ulo pra hindi masyadong hollow tignan. Second, ipa LED ko ang headlights at palalagyan ng relay box para steady ang liwanag at hindi magdidipindi sa revs ng makina mo..
i just bought my honda beat 2014 on september this year, but yestrday it the starter refused to work, didnt have a choice but to use kick starter, i brought the mc to the dealer, they charged the battery for about 2.5 hours, sbi n drain dw yung baterry.. I had the same problem with you bro. Mga 3 months palang yung orig bat na drain na. We tried recharging pero ayaw magrecharge so I bought a new batt nalang. Dealer did not replace my batt. yesterday my beat refused to auto start again, i brought it again to honda, sbi need to charge for about 4hours, eto papunta nko dun para blikan, ganon b tlga? every 2 weeks ppcharge ako? kkbili ko lang last sept 2014, wla p nga yung registration ng motor. what happened aftr you replaced it w/ new battery? ilang months na n hindi n drain? thanks. I replaced mine with Japan battery bro. Hindi talaga na drain after almost 3 years. @Ronel - Im not sure what are the causes. Maybe the others can help explain. @anonymous - I'm in Liloan barangay Yati bro. Your reviews regarding the Honda beat is very informative. I'm getting one maybe by January. My current mc is xr200 motard wc I used as daily commuter but its tiring in manuevering especially in traffic. I saw my neighbor had a Suzuki skydrive, I am weighing my option if I will get beat or skydrive. But since majority of the post had a positive insights, I will get the beat. I also had wave 125s yr.2004. I live also in the mountain brgy of cebu. Glad that you find this review informative bro. Enjoy your beat. Sir Rene, sadya po bang ang running condition ng scooter e paiba-iba? Minsan smooth, minsan rough parang gigil ung makina. I have my Honda Beat for 1 week and im really confused. 2nd MC ko kasi to my first 1 is a Honda xrm 125 2005, and this is my very first scoot.So hindi ko po talaga alam kung pano manakbo ang scooter not like the chained MC na iisa ang takbo niya. Please help, give me some peace of mind. I really love my Hona Beat coz itsmy wife's gift for me this xmas. Thanks. hindi ko na experience yang paiba-iba na running condition bro. I suggest consult a mechanic for that. I checked OLX bro. Nasa 30-40k yung 2nd hand. payo lang po since first time scooter owner ako, panu po b yung proper break in ng honda beat..
Helow Sir Rene! thanks for this review I will choose Honda Beat! sir okay lang ba gamitan nang lowering bracket? ano po disadvantages nito? Yes! Honda Beat!! thanks for this review, Sir ask ko lang okay lang ba gamitan nang lowering bracket ang honda beat? meron po bang disadvantages? Whew it is a long review, I am convince with BeAT, thanks for this review, I already tried to compare these 2 scooter check this link: http://motortrade.com.ph/motorcycles/compare/honda-beat-110-alloy/yamaha-mio-sporty . The reason why I choose Honda Beat, 1st kaya ako mag momotor kasi para makatipid 2nd dapat safe 3rd Durability and Quality, kasi dumadami case ng accidents ng mga motor. and compare to MIO more on design and porma modification and upgrade at di naman ako kakarera heheh pang araw araw lang. ^_^ I will get my Honda Beat soon. Nice. Share your review also here so others may see. help naman po yung honda beat ko nahihirapan sya sa accelearation then pag nag speed up na nag slow na sya.. anong cause po non? I once had this problem po before. I had it changed oil and it went back to normal. Greetings Sir Rene, I have been reading and doing some research about Honda Beat, as I am planning to buy my first scooter. So far I am getting positive feed backs and experiences on Beat over Yamaha Mio variants . I was just wondering if can you give more idea/s or pointers on how well the Beat's 1. handling 2. balance 3. stability is faring. One thing I asked this ( as far as I am concerned) is that my wife would also want to ride it, and I must admit, she doesn't actually have an extensive experience or background in riding a motorcycle. napurchase ko honda beat ko 2014, nsa 6K+ odometer plng ako. meron kasi akong naririnig na kakaiba during long runs ko na parang tunog lata, sa umpisa maganda/OK pa tunog pero nung medyo tumatagal lumalabas na yung tunog lata.. dko sure kung tunog ba ng muffler ito or engine, ano kaya yun? i usually ride my beat papasok ng office 3times a week, traveltime ko is 45-50mins at 50-60 kms. mga 2 months ko na naririnig ito. regular naman maintenance ko. hope you could help.. TIA! Sir , panu po pag iba type ng oil nilagay nung binili ung beat , diba po kaylangan unleaded muna . xcs po kasi daw nilagay e , diniliver nalang kasi dito sa bahay ung binili ko na beat . Panu po magpapa'refill na po ako ng fuel . Unleaded naba ipapalagay ko . Hope you could help. TIA. I am past my golden years, in fact, already a senior citizen. For some time since graduating from college, I can't figure out myself driving a motorcycle. As an erstwhile OFW, my obsession had been focused on electronic gadgets such as stereos, televisions, cameras, computers and others while possessing a motorcycle never occurred to my mind. I own two bicycles for my fitness. This mindset changed when a friend came up with a suggestion to give up my bikes and switch to motor rides for my long distance errands. The joke had struck me indeed rousing my interest since he blurted it out. The problem now lies on which brand and type (underbone, cub, scooter, which one) to buy. For a time, I have been googling up for comments regarding the features of a particular brand. Being a newbie, I found the forum discussions exasperating as majority of the participants delved more on the technical side rather the more important features of the vehicle like durability, value for money, etc. Although my choices are confined to what they refer to as the Big 4 (Honda, Yamaha, Kawasaki and Suzuki) I remained undecided until I came across this site. Honestly, I found your review simple and easy to understand explaining the unfamiliar in plain language. 1. Can this model withstand long distance trips and able to tackle elevated highways like those found in Baguio or similar places with ease? I am conscientious rider hence, I don’t mind gassing up frequently for as long as the engine does not complain. 2. Despite its safety lock feature, robbers will surely find a way to steal it so how safe it is really from thieves? Does it need additional gadget to ensure a 100% security? Assuming that the answers are positive Sir, I think I have already found the ONE that suits me and HONDA BEAT is. Kamusta po lahat kayo dyan na mga kagaya ko na proud owner ng honda beat. Kaka bili ko lang din po ng beat ko nitong month of january 2017 ( fi standard white) eto lang po yung mga na experince ko na gusto kong mai share lalo na sa mga gusto pang bumili ng honda beat, hindi po kayo mag sisi kase ok na ok po yung performance ng beat malakas at mabilis po yung engine at sobra tipid sa gas. Ako po yung naiinip dami ko na napupuntahan ayaw po maubos yung gas hehehe. Add ko lang po yung gas na ikinarga ko nung last week regular gas ng flying v ok parin po yung andar ng makina halos wala rin po nag bago sa performance nya. Hello sir Mauie, thanks for commenting. I think may slight difference sa speed lang because of your weight pero kung sa overall performance nya, sa tingin ko walang problema. But I suggest getting Yamaha SZ16 or Kawasaki Rouser for your build. ano po kaya problema ng beat ko sobrang usok ng tambutcho nya tapos mga 2 months lang ubos na ung oil nya help naman po thanks . Hello sir, kaya sobrang usok kasi nasusunog yung nagleak na oil. That is why madaling maubos yung oil nya. Ipacheck nyo po yung block nya and piston ring. I think dapat ma overhaul yan. Hello sir, I recommend changing the oil every 2000 kms on your odo reading. Usually mga 300 magagastos if sa service center. hi sir i would like to ask, kasi naghihingi ako ng advice kung yamaha or honda ang piliin eh lagi nila akong sinasabihan mas ok yamaha "mio" pero paramg yung puso ko na sa honda beat haha pls an advice lang kasi im planning to buy my 1st mc and medjo dindown nila honda beat. Bakit kaya? Hello sir. Please help me..di kasi ako makapag decide mio i 125 or honda beat fi combi break.. panget daw combi break? Diko kasi maintindihan..
Hi sir rene. Ask ko lang.. binigyan ako ng motor ng tito ko. Honda beats model 2012 or 2013 ata to. Okey lang na to gamitin sa year 2018? Hindi po ba masyado na luma to pra isabay sa mga new models ng beats? So far so good naman. Okey naman gamit ko. Problema lang naexperience ko ng stock up yun ignition ko. 30 min ko ata tinatry on yun beats pero ayaw talaga. Yun father ko lang ang ngtyaga mag labas pasok ng susi para maunlock un motor. Thank you very much kuya. Okay lang yan basta maayos pa ang andar nya. Make sure lang na may regular checkup/maintenance ka. kakabili ko lang ng beat ko kahapon. (Actually pasalo lang sya) 10k odo for 10 months sknya. pagkakuha ko is nag pakarga ako sa navotas ng full tank. taga fairview ako. well nakauwi na kami lahat lahat wala padin bawas sa gas. 2 pa kami ng wife ko nun. sa bahay ginala gala ko pa din pero wala pading bawas. nung papasok lang ako ng work kinaumagahan saka nag karoon ng bawas. ang bilis nya. sisiw sknya abutin ang 100kph(wag nyo na gawin pero masayang delikado) happy ako kay bella(beat) ko dahil sa performance. and alagang alaga nung prev owner nya. HINDI KAYO MAG SISISI pag kinuha nyo to. I have Honda BeAT FI v2. I just purchased a Honda Beat at the age of almost 67 years young! I chose it over the Wave because it's all automatic. And at my age I probably require as much ease of handling as possible. I am having a VERY lightweight side car put on it so my furkids and I can take rides to the beach, nature parks etc. I know this is generally not recommended. But the most highly recommended side care manufacturer in Lucena City and I discussed making it as light weight as possible and we designed the side car with this in mind. Sir ask ko lang po kung malakas ba sa konsumo ng gasolina itong Beat? Kasi Honda Wave 125 ang motor ko now at sobrang tipid sa Gas. Nalaman ko kasi na binebenta ng Beat ng classmate ko pero parang nagaalangan lang ako kasi baka di niya kasing tipid yung wave ko. Sir may life span ba ang computer box ng Honda Beat FI? Hi mga sir na acquired ko brand new honda beat fi last june 2018 saan po ba yung adjust ng idling at may ingay ako marinig near sa gearbox sa morning start after 1minutes..pls advice with tnx..
Hello sir Good day, well I was planning to buy a Honda Beat just like what you have but my budget is only fit to a 2nd hand Honda beat what could be the basis for me to check if the 2nd hand scooter im going to buy will be reliable ? please response Thank you so much . Hi Sir.. Got my Honda beat (iss/cbs) last october 5, 2018 nasa mga 450+ palang po sya pede na po kaya sya ipa change oil? 1 month na po baby beat ko ngayon eh. Mga boss yung honda beat fi 2018 ba e vomputer box? boss rene , asa ta kapalit ug japan nga battery dre sa cebu? First time biker here. Got a Honda Beat Fi ISS combi brake last Dec. 2018. Experience is very satisfying. Very easy to drive kahit newbie at golden boy na. Travel home to office almost daily and napakadali isingit sa Metro trafficccc.. No problems encountered going 1000 kms na. Ive had my Honda Beat FI with Combi break and Idling stop system for almost two years now. Never failed me. Only had to change the original battery it came with, a month ago. Change oil every 1500 kms on average (onetime i went on 2000 kms before changing oil, will not do that again) When i used premium octane 97 from gasso the engine wants to go very fast even with a weak twist of the throttle so i went back to octane 91. Changed the original headlight bulb which lost its low light but hi light was still working. One liter can go 58 to 60 kilometers sometimes even 64 km but thats hi way driving. I did change the rear tire once because of a nasty metal piece of junk on the hiway that i couldnt see because it was raining hard. Dented my mag also but had it repaired (pukpuk martilyo) im glad i didnt have to replace the mag also but yes its just a bit benkong that can be felt at speeds 60kph and higher. but tiyaga tiyaga na lang. Nalaglag ko na siya 2 times but himala since i hardly go fast i was never injured because these happened when my wheels got trapped in a rut while trying to turn and the aforementioned puncture. The great thing about scooters is the fact your legs are in the scooter so if you fall right or left, your legs arent trapped by the scooter. If you get hit from the left or right, your legs wont be squeezed in between the two vehicles since its in the scooter. When i fell both times i was able to turn my entire body so i landed on my palms. I was able to get up right away without anyone needing to come over to lift the scooter from me, which can happen with motorcycles and scooters like the nmax etc which have no space in the middle to hid your legs from harm. I also have a click and even thought the click is more stable at hi speeds, more comfortable to sit and drive for long hours, the beat cant be beat for fuel consumption so the beat is my daily driver.